We have started collecting rare comic books and comics-related archival materials concertedly in the Columbia Rare Book and Manuscript Library, propelled by the enthusiasm and efforts of our colleague Karen Green who has built up an impressive array of comics and graphic novels for the circulating collection. 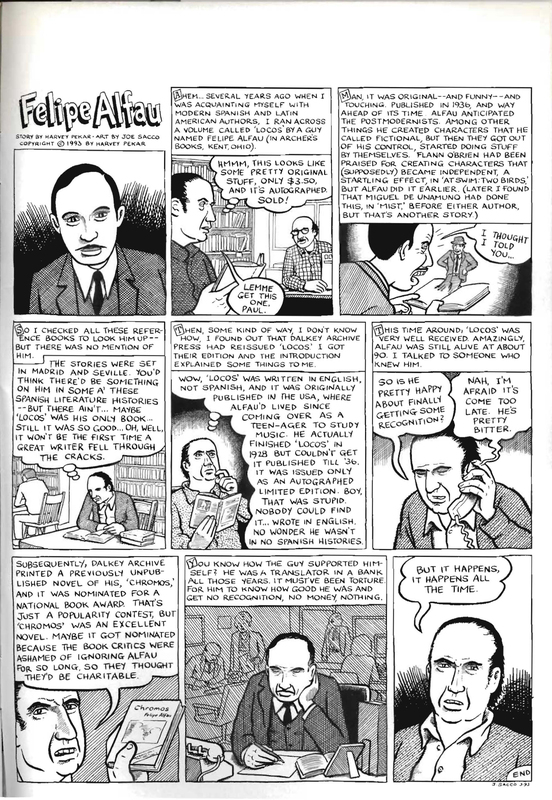 There are many points of contact between these newly arrived comics and many of our existing collecting strengths in literature, journalism, and publishing, as attested by this recently acquired 6-page manuscript by Harvey Pekar. 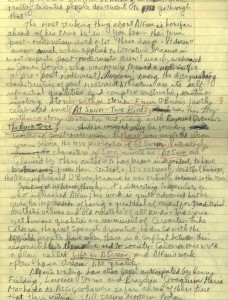 This draft contains preliminary writing for what resulted in a one-page panel about Felipe Alfau by Pekar drawn by Joe Sacco. Felipe Alfau was a Spanish-born Anglophone novelist now considered a precursor to James Joyce and other experimental and “proto-postmodern” authors. 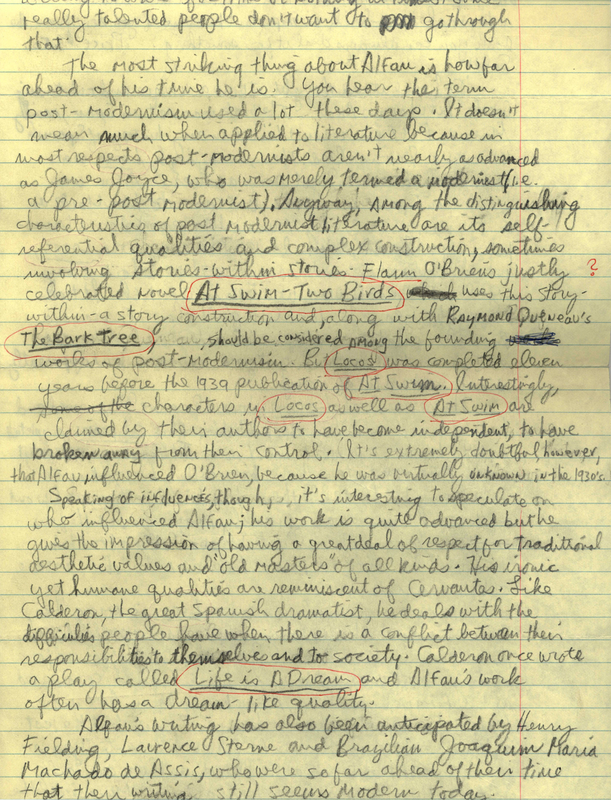 In the draft Pekar also compares him to Flann O'Brien, Raymond Queneau and Cervantes. Although we do not usually collect such small archival pieces, I could not resist this one because it connected not only to our recent comics and graphic novel acquisitions, but also our holdings in publishers' archives. In the panel Pekar mentions that the Dalkey Archive Press re-issued Locos and then published a previously unpublished Alfau novel, Chromos. In fact, Alfau's typewritten manuscript of Chromos is one of the amazing documents that came to Columbia with the Dalkey Archive Press archive, which we are still in the process of unpacking and processing. The draft runs six handwritten pages and goes into greater detail. The differences between the manuscript and the panel show Pekar pulling out a story from the mass of details, and also the extent of his efforts to place Alfau into a literary tradition. The draft bears the scrub marks of erasers. Even when generating the text, Pekar chose his words carefully. It gives a glimpse into Pekar as a reader of experimental narrative and metafiction, an autodidact who takes on reading assignments, and book collector who sought out both autographed copies and re-issues with critical introductions. We now have both Pekar's draft for this panel and the published panel, which appeared in Dark Horse Presents #104 Pink Tornado. We will keep the two together as Columbia RBML MS collection #1650. This entry was posted in Uncategorized on March 22, 2013 by Karla Nielsen.